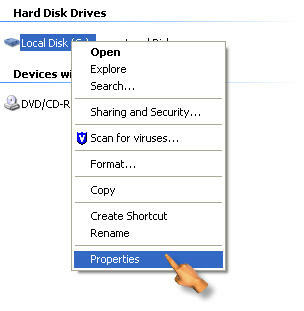 Open My Computer (Start, My Computer) then right click on the drive you want to scan and select Properties. Select the Tools tab, then click on the Check Now button. Click on Start to begin the scan. 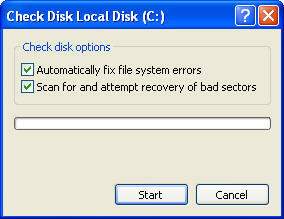 You can also select the Automatically fix errors and Attempt recovery of bad sectors options to have Windows fix any errors it finds during the scan. If you select these two options, you will get an error message telling you that you can’t run the scan because files are in use. In order to run the scan with these options selected you will have to agree to run the scan the next time Windows boots up, before the operating system has completely loaded. 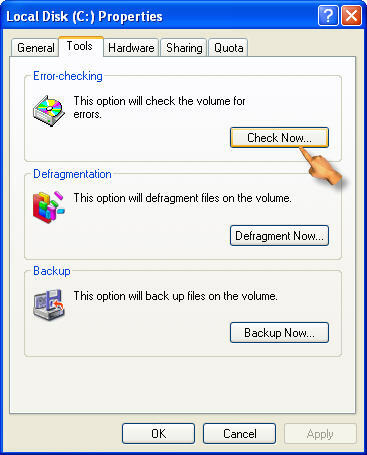 Check Disk should be run on your computer on a regular basis (such as once a month) to keep your system running optimally.